Clare Moody, MEP, is the co-chair of Friends of Georgia Group in the European Parliament. 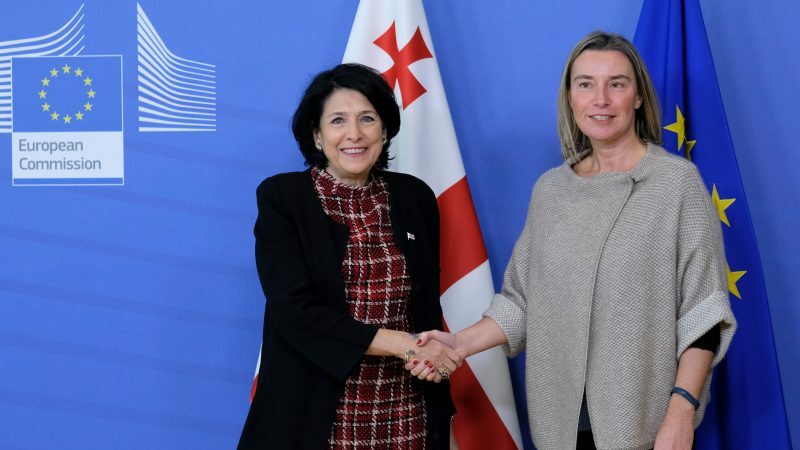 This month, Brussels welcomed Salome Zurabishvili for the first time as the new president of Georgia. It was her first overseas visit after taking office and shows the priority she is giving to relations between Georgia and the EU. This was an important visit for both Georgia and European member states, and I was pleased to meet with Salome Zurabishvili while she was here. In 1918, Georgia gave every woman the right to vote, ahead of almost all European countries. Exactly a century later, Georgia elected a woman president, once again leading the way in women’s representation. Depressingly, only 7% of heads of state or government around the world are women but in December, this small but impressive band was joined by one more, with Salome Zurabishvili’s inauguration as president. It is clear that Zurabishvili is a worthy member of this group. Her family were political refugees from Georgia but when she was given the chance in 2003 to move back to her home country, she took it by becoming France’s ambassador to Georgia. Just one year later, she embraced the chance of serving her country and took on the role of Georgia’s foreign minister. Her career up to this point prepared her well for taking on the responsibilities of president. She studied at the world-renowned Sciences Po in Paris and at Columbia University in New York before joining the Quai d’Orsay. From there she became a career diplomat, with postings in Rome, New York, Brussels and Washington. As Georgia’s foreign minister, she negotiated the withdrawal of Russian military bases from Georgia and travelled extensively to help her country’s aspirations towards membership of the EU and NATO. In March 2006, she founded a new political party, ‘Georgia’s Way’, and served as the leader and honorary chair of the party until 2010. As an MP, she played a leading role in revising the constitution and supporting the Georgian diaspora, the occupied territories, education, science and culture. In addition, she is a talented linguist and has written several books about Georgia, whilst retaining her links to Sciences Po as an associate professor. Despite such a range of achievements and experience, Zurabishvili sadly faced what so many other women in leadership face– a level of abuse that no men have to endure. Georgia is well known for having ‘robust’ political debates but commentators have remarked that the tone in this presidential election was particularly prejudicial. It is to Zurabishvili’s credit that she faced down the misogynist attacks, and it is to Georgia’s credit that despite them she won the final round of the election with nearly 60% of the votes. In contrast with her treatment during the campaign, her own platform was based on a very positive agenda. Her campaign focused on her experience, promising to act as a bridge between the people and the state. She has a strong record in promoting a more tolerant political discourse – something that I am sure the people of Georgia will welcome – as well as human and minority rights and gender equality. Among her campaign promises, she committed to the promotion of Georgian culture and to the support of the Georgian diaspora, as well as to providing greater transparency, youth initiatives and a hotline for citizens. Having been endorsed by the ruling Georgian Dream government, Zurabishvili has a good chance of implementing most of her manifesto commitments. This will surely move Georgia forwards in a more open and progressive direction. As the EU regularly observes, Georgia has made remarkable progress in enshrining democracy, human rights and the rule of law. Many hope it is only a matter of time before Georgia fully integrates into the EU and NATO. There is no doubt in my mind that Salome Zurabishvili is prioritising this agenda and will continue to work tirelessly for her country, doing all she can to promote these aims.